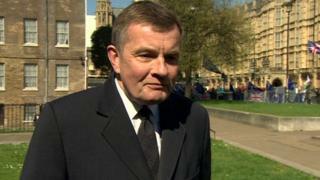 "My vote is a matter between me and the ballot box," David Jones, MP for Clwyd West, told BBC Wales. EU leaders are deciding later whether the UK's Brexit date should be extended. A long extension is likely to require elections for the European Parliament to be held on 23 May. Theresa May has asked for an extension to 30 June to get the Brexit deal passed in the House of Commons. But EU leaders are expected to offer a longer delay, with conditions. The UK is currently due to leave the EU on Friday. When asked whether he might vote for UKIP or the newly-formed Brexit Party Mr Jones said: "My vote is a matter between me and the ballot box." Asked if it was not guaranteed he will vote Conservative, he added: "I've given you my answer." Mr Jones said the prime minister should be ensuring that the UK leaves the European Union "as quickly as possible" and that the current situation is "humiliating, not just for the prime minister herself but for the country as a whole". He said if European elections take place in the UK because of a delay to Brexit "it's going to be a pretty farcical situation" and that many Conservative Party members would be "reluctant to participate" in the vote. Simon Hart, Conservative MP for Carmarthern West and South Pembrokeshire, said while he will continue to vote against a new public vote on Europe, "I can see how it would be the last game in town". He said: "The problem we have here is there are so many entrenched views that it's almost impossible to see how anything else can happen but an extended delay, and then we may be into leadership situations or even, much against my better judgement, into a situation where the only option left standing is around a confirmatory vote from the public because Parliament has failed in its duty to be able to resolve this." Earlier Wales' first minister Mark Drakeford said the assembly could be recalled if Mrs May's request for an extension fails.